Polygonatum multiflorum and Polygonatum biflorum are both known as Solomons Seal and are the two most common species found for sale in Australia . A shade loving perennial with great green arching foliage Solomons Seal has attractive white nodding flower that hang below the foliage. This tall growing perennial will reach 50 – 70 cm depending on conditions and prefer a cool position in dappled shade. Solomons seal will spread by under ground rhizomes however it seems to be easily controlled by pulling out any unwanted runners. Growing from rhizomes that will spread underground Solomon’s Seal can also make an interesting feature when planted in a container. Coming to life in late spring, the flower stalks are tall and the flower hang gracefully below the foliage. The foliage holds well through summer in a shaded position. As it is tall growing it can be used to a add a little height amongst other shade loving plants. We tend yo let it roam, and if it wanders to far, simply dig it up in the spring. Solomons seal is readily available for sale by mail order during dormancy in the the cooler months. Polygonatum nodosum is an interesting species from China with broader leaves than the normal species. Purple berries in autumn. Polygonatum odoratum Variegatum is another species with its own attraction, nice foliage with darker red stems, again pretty hanging white flowers. Look for the dwarf form Polygonatum Hookeri . Solomons seal prefers a shaded position in a humus rich well mulched soil. Delicate white flowers appearing beneath the arched foliage in spring look fantastic. 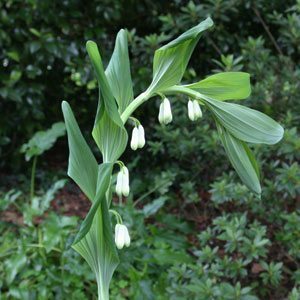 We have seen Solomons Seal used in pots where it tall habit and arching stems make an interesting display of foliage, particularly when in flower. A number of varieties are available all with slightly different characteristics. P. cirrhifolium – Coiling Leaf Solomon Seal E. Asia – China to the Himalayas. Best suited to a Woodland Garden, with dappled shade or a shaded border situation. P. Graminifolium is a smaller growing species to 15cm. P. Hookeri is an unusual, dwarf form to 10cm. P. Odoratum Plena and P. falcatum ‘Variegatum’ are others.